Here’s a secret to share with all of you: I am not neat. At all. I like to say, I’m organized in my head, everywhere else, not so much. And as someone who writes about TV, I get a lot of fun TV swag mailed to me. As wonderful as that is, it also means a daily deluge of clutter to keep up with. My goal is to be able to see my office floor by Christmas (sadly that is only a slight exaggeration). Therefore, for the holiday season, I’ve begun clearing out my TV Swag coffers and will be giving it away to all of you. Everyone who is a follower of my blog by 11:59 p.m. EST on Monday, December 3 will be eligible to participate (I don’t even care if you’ve been naughty or nice this year, although I prefer nice). Beginning, Tuesday December 4, I will give away one prize every weekday until December 25. Each day, I will pick a number at random (generated by random.org) and give a swag item to the person who matches the number on my list. For instance, if the number is 52, I will give it to the 52nd person who signed up to follow my blog. You will get to choose which TV swag item you would like until all the swag is gone. So, if you haven’t already, sign up to follow my blog and help me clean out my office. Here’s the list of swag I will be giving away. Don’t delay. Sign up to follow my blog today! You can only tell so much in a show’s pilot. You can sense the potential or lack thereof. You might know at a gut level whether you’re interested in the characters or not. But really the pilot is merely a peek into what could be. I had no idea when I watched the pilot for Buffy the Vampire Slayer that it would turn into the landmark TV. But I knew from the moment I watched the first episode of Arrested Development that it would most likely become one of my favorite TV shows of all time. With that in mind, let’s check back in on four new shows that have been picked up for the full season. The New Normal (Tuesday at 9:30 p.m. on NBC): To my utter surprise, I’m still watching The New Normal. So there’s definitely something there that keeps me coming back each week. Perhaps it’s just to see what Babe Wood Shania will do next. Wood is the discovery of the season. And while the show isn’t as funny as it needs to be to actually be a comedy, it has, at times, been surprisingly poignant. I loved the episode the October 23 episode that found Bryan and David searching for godparents. When the show tones down its preachiness, it is actually capable of providing thoughtful commentary. But, as much as I hate to say it, Ellen Barkin’s Nana is a huge, almost insurmountable problem for the show. There’s some sort of graduate student thesis that could be written about why Sue Sylvester works as a character on Glee and Nana doesn’t. Both women make absolutely outrageous homophobic and racist comments. Both women have no problem doling out vicious, personal attacks. Both women are, on the surface, beyond offensive. Yet Sue has always provided great entertainment value. Nana is cringe-inducing. Perhaps it’s because The New Normal has given Nana no redeeming qualities. She is the cruelest to her own granddaughter. Seeing Sue with her sister let the audience know that she had a loving side to her and I always feel that, on some level, Sue actually cared about her students. Nana is merely angry at the world and that much vitriol in an endless loop is tedious to watch. Nana needs to go back to Ohio. The Mindy Project (Tuesday at 9:30 p.m. on FOX): There is so much that is not working about this comedy and it starts with Mindy Kaling. As I said in the review I wrote for Paste Magazine this week, Kaling’s character becomes increasingly unlikeable with each passing week. The crux of the problem is that she’s playing a doctor -not just any kind of doctor, an OB/GYN. If you want women to watch your show, you really can’t mess around with that. Most women have a trusted relationship with their OB/GYN. These are the doctors who know your most personal information. They see you through your pregnancy and the delivery of your baby. As I’ve always said, I don’t need a ton of realism from my TV shows. But I need to believe that Mindy actually is a doctor. (At least to the same degree I believe Phil Dunphy is actually a real estate agent or Robin Sherbatsky is actually a news anchor). 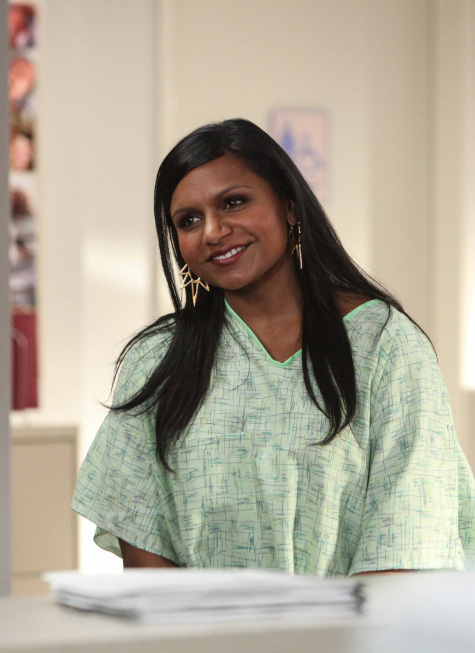 So I want to watch a comedy where Mindy is actually good at her job and cares about her patients. I want to believe the premise the show is built on – that Mindy has her professional life together but her personal life is a mess. Dr. Lahiri and her colleagues don’t seem to ever work. Mindy is vapid and vain. I wouldn’t trust her to paint my nails. She would probably stop half way through so she could chase a boy or try on outfits. There are so many other problems with the show (beginning with the painful underutilization of Anna Camp) but if your main character isn’t working, the rest of your show isn’t going to work. Mindy Lahiri needs a profession where other people’s lives aren’t at stake. I fear the character’s career choice is fatal error from which the show cannot recover. Elementary (Thursdays at 10 p.m. on CBS): The biggest problem this crime drama is facing is that it keeps casting familiar faces as the weekly bad guy. The show films in New York City. It needs to take a page from the Law & Order playbook and start casting more theater actors – faces that viewers don’t know. Because if we see David Costabile, who has had major arcs on Breaking Bad and Damages, as a janitor, we’re not fooled. We know he is probably the bad guy. And if we solve the crime before Sherlock does every week, we are going to get bored. My other issue with the show is that Lucy Liu and Jonny Lee Miller are giving incredibly strong performances but the series is struggling to integrate the mystery part of the show with the interpersonal aspects of the character’s lives. It is often clumsy and awkward. Nashville (Wednesdays at 10 p.m. on ABC): This was my favorite new show of the season and, for the most part, it has lived up to my expectations. I’m enjoying the continuing development of Rayna’s character. Given my affection for Friday Night Lights, I expected Rayna to be a tough-as-nails/heart-of-gold type character. But she’s evolved into something much more complex than that. I like that I don’t always like Rayna. Deacon, who she clearly loves, calls her from jail and she declines the call? That seems awful but it also tells me quite a bit about their shared history. Maybe this is the fifth, tenth, or twentieth time that has happened. I would like to see Eric Close’s Teddy be less of a pawn in everyone else’s game. But the character I’m having the biggest problem with is Scarlett. As much as I love Scarlett’s music, I’m not that into her character. Her little-girl-lost act is grating and so is her stand-by-her-man nonsense – at least she stopped standing by her man last night. It’s tricky to play a character that fragile and innocent and still make her compelling. So far Scarlett is the show’s weakest link. What new shows are you still watching? How do you think they’re doing? Talk about it below. If you’ve heard a great quote or seen a terrific familiar face, email me and let me know. And remember to sign up to follow my blog (upper right hand corner) if you want to be part of my December TV Swag Giveaway. I get attached to TV shows and when they’re gone, I often have a hard time letting go. Until recently my TiVo still had a season pass manager to Friday Night Lights. (I liked the idea that it was constantly searching for new episodes. I held out hope that maybe it would find one). Every year I’m thrilled when TV actors I adore are in new projects. But the TV landscape is still missing some of my favorite actors. I’m not talking about the obvious choices. Clearly Josh Holloway and Kyle Chandler need to be back on TV. I’m talking about the lesser-known actors who played such a distinct and memorable part that their show would not have been the same without them. Here are my picks for the faces that have been away from TV for far too long. Amber Benson (Tara Maclay on Buffy the Vampire Slayer): Benson was utterly fantastic as Willow’s patient, loving girlfriend. She’s an actress who can express so much with her plaintive eyes. I’m perplexed that she hasn’t landed as a series regular somewhere. Janel Moloney (Donna Moss on The West Wing): Together with Bradley Whitford’s Josh, Moloney created one of the great will-they-or-won’t-they couples of the last decade. Her rat-a-tat banter with Josh was part of the reason The West Wing was such memorable television. Aaron Sorkirn tried to recreate the same rapport with his characters on both Studio 60 on the Sunset Strip and The Newsroom but Moloney was one of a kind. Luke Macfarlane (Scotty Wandell on Brothers & Sisters): Is it wrong than he was my favorite Walker? With his sympathetic face and kind demeanor, Macfarlane quietly broke ground as one half of TV’s most realistic gay couples. Keiko Agena (Lane Kim on Gilmore Girls): A girl couldn’t ask for a better best friend than Lane. She was loyal yet independent. Supportive but always willing to offer constructive criticism. Agena infused Lane with a believable likeability and also added depth to a character that could have been a TV stereotype. Jamie Kaler and Michael Bunin (Mike and Kenny on My Boys): You know all the hilarious exchanges between the guys on New Girl? The boys on My Boys were doing that long before Jess met Schmidt and the gang. Real life buddies Kaler and Bunin have a great time riffing with each other. They had their own show last year on DirectTV, On Deck with Jamie and Mike, but I would love to see the duo whooping it up in a comedy again. Don’t tell the others, but they were always my favorite boys. Bryan Batt (Salvatore Romano on Mad Men): Every season of Mad Men, I think “this will be the season Salvatore makes his triumphant return.” His departure from the series, while completely reflective of the time, was so abrupt. Batt brought a lovely pathos of a man leading a duplicitous life. Who would you like to see back on TV? Talk about it below. And remember to follow my blog by entering your email in the top right-hand corner. I’m gearing up for a big December TV swag giveaway for the followers of my blog. ‘Once,’ ‘Glee,’ ‘Grey’s’ & ‘Up All Night’ – Has a Change Done Them Good? TV shows must evolve. Stay in one place too long and the show will exasperate viewers (see How I Met Your Mother), change too much and viewers feel as if they’re tuning into a completely different show (see Heroes). Up All Night (Thursdays at 8:30 p.m. on NBC): It’s never a good sign when a show completely reinvents itself in its second season. I take it as an implicit confession. “Um you know all that stuff we did last year? It didn’t really work and we know it.” So Up All Night took away Ava’s (Maya Rudolph) talk show, put Chris (Will Arnett) back to work, had Reagan (Christina Applegate) become a stay-at-home mom and introduced the character of Reagan’s brother. None of the changes really stuck. I miss Ava and Reagan’s work environment (especially the dear, departed Missy) and Ava is stranded with no real reason for being on Up All Night except that she’s played by Maya Rudolph. (It’s a bit of a circular problem for the series since last season’s focus on Ava’s talk show stemmed from Rudolph’s Bridesmaid’s success). Now, all of Ava’s story lines are ungracefully wedged in. (Really, do we need to see Ava’s version of a haunted house? Maybe she and Sean Hayes can spin-off into their own show. ) Without Ava’s show, it’s hard to understand why Ava and Reagan are friends. But we can’t spend any more time talking about this because Up All Night will air two more episodes this fall before returning in the spring in yet another incarnation. This time the single camera comedy is changing to a multi-camera show (As a point of reference, New Girl is single camera, The Big Bang Theory is multi-camera).That means a live audience and a more limited, static stage (the days of Reagan and Chris taking walks with baby Ava outside are probably over). I wouldn’t be surprised if more things changed between now and then (the show is shutting down production to redo the stage). If you want my truly fearless prediction, I’m ready to double down that the show won’t come back at all. I adore Arnett and Applegate. As a parent of a toddler, this show is made for me. However, Up All Night has always had flashes of smart humor but it’s never quite come together. And I’m not convinced the third iteration will be the charm. I am trying to think of when a show reinvented itself and it worked and the only example I could come up with was when These Friends of Mine became Ellen after one season. Once Upon a Time (Sundays at 8 p.m. on ABC): The drama took a gamble when it blew its original premise away in the first season finale. Certainly it could have wrung a few more seasons out of everyone in Storybrooke not realizing they are actually fairytale characters. In the second season premiere, the show transported its two lead characters back to fairytale land. Now the show has three worlds – Storybrooke, the fairytale world that was and the fairytale world of the present. That’s a lot of different worlds for viewers to keep up with in 42 minutes. And it’s doubled the amount of special effects which I’ve always found problematic. The fairytale world looks like the characters are stuck in a video game. I now rate all special effects on a scale of 1 to Sarah Michelle Gellar’s boat scene in the Ringer series premiere (with obviously the Ringer scene being the worst.) On that scale, I would put the Once Upon a Time special effects at about a five. That combined with the idea that Jennifer Morrison can take a Clark Kent approach to looking younger (give her a pair of glasses and she’s 17 again!) often takes me out of the show. I’m nervous about the amount of characters the show continues to introduce – again it’s a lot for viewers to keep up with. But I really do appreciate that Once didn’t go the traditional route with its narrative. I love the introduction of Michael Raymond-James as Emma’s ex-boyfriend and Henry’s father. (In my world of denial, Raymond-James is on the show as part of an elaborate and belated Terriers crossover). And putting Emma and Snow together with the mutual mission of being able to return home is a great way to quickly bond mother and daughter. But in general my advice to the show would be the same my father used to give me when I was little and talking really fast – slow down. We don’t need to meet every possible fairytale character this year. Every episode does not have to take place in three worlds. Let’s leave something for season three. Grey’s Anatomy (Thursdays at 9 p.m. on ABC): My favorite part of this whole season has been Cristina’s budding relationship with Mr. Feeny, I mean Dr. Thomas. Much like he did for Cory and Topanga, Dr. Thomas is full of sage wisdom for Cristina. He’s also softening her character and helping her realize she still has a lot to learn about being a doctor. Plus it just makes sense that Cristina would move on and leave Seattle Grace. I never truly believed Cristina and Owen as some grand star-crossed couple so I’m okay with them being apart. The biggest problem I see the show facing is what to do now. I’m fine with Cristina working and living far away but is that a sustainable model? My other big gripe with the season is the Arizona story line. I’m simply not believing that Arizona, an informed, educated doctor who has made a career out of making difficult medical decisions, would blame Callie. Yes I understand that she’s mad at what happened to her and yes Callie is the easiest person to take her anger out on but I’m still not buying it. It’s a perfectly believable reaction of someone who went through this level of trauma, but it’s not working for me. Perhaps it’s because the show spent so many seasons building Arizona up as this perpetually cheery character. Glee (Thursdays at 9 p.m. on FOX): This fantasy version of New York City is a bit ridiculous. Suddenly Rachel’s waking up in the morning with hair extensions, full make up and false eyelashes. Everything that was grating about Rachel Berry has become exacerbated in New York. But that’s nothing compared to the Kurt storyline. I could go along with the fact that he gets a job at Vogue.com based on his charm and edgy style. But that Sarah Jessica Parker’s Isabelle Wright would confide in him? That one’s little hard to believe. And her fairy godmother act isn’t that interesting. I keep waiting for her to steal one of Kurt’s ideas and claim it as her own. Back at McKinley High, all the new students have edged out the adult characters. Sue Sylvester, who was a defining part of putting the show on the pop culture radar, has barely been seen this season. And Will has nothing to do. He’s to this season of Glee what Cindy and Jim Walsh were to 90210 once Brenda and Brandon graduated. Glee needs to find better, more relevant storylines for Mr. Schu and find a way to better balance its multiple characters and multiple locations. How do you think Once, Glee, Grey’s and Up All Night are doing? What other shows do you think have undergone major changes this season and how do you think they’re doing? Talk about it below. On Thursday, I’ll have this week’s best quotes and familiar faces, so if you’ve heard a great quote or seen a familiar face email me and let me know about it.